Janeway doesn't go back to save any other casualties. Despite sending Voyager home (at the last possible instant), it still manages to fail at satisfactorily wrapping up the show. 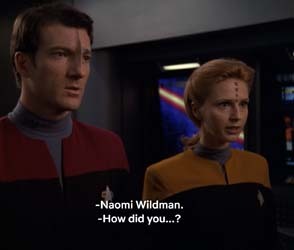 Add to that the questionable characterization of Janeway, who is willing to violate the Temporal Prime Directive to save Seven of Nine, but doesn't seem to care enough to go back a few weeks sooner to save Joe Carey, or even further to save Lyndsay Ballard, Ensign Jetal, or Lon Suder or his victim Frank Darwin, or Ensign Hogan, or First Officer Cavil or any of the other Voyager crew who die in the Caretaker's displacement wave, or any of the other crew who died in the Delta Quadrant. Both TNG and DS9 ran for seven seasons, and Voyager was expected to do the same. So I think most of the audience kind of figured that the last episode of that seventh season would end up being the one in which Voyager finally gets home -- after all the "Gilligan's Island" shenanigans that it will take to get there. But this didn't necessarily have to be the case. 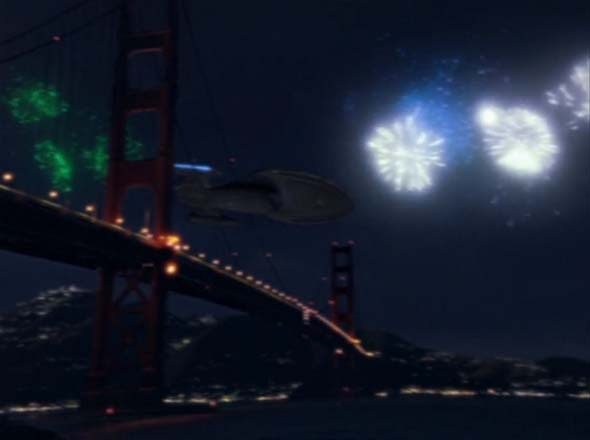 TNG's finale concluded with the crew of the Enterprise going on with their daily business, with the promise of more adventures to come: "The sky's the limit". 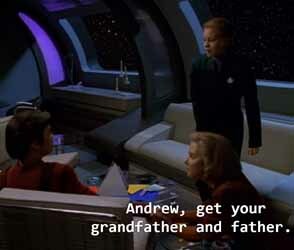 If Voyager wanted to rip off of TNG again for its finale, this is the idea that it should have stolen. The one thing that "Endgame" does even remotely well (aside from indirectly canonizing Star Trek: The Experience), is that it is a direct parallel to the series opening "Caretaker". TNG, DS9, and Voyager were all very good about tying their finale into their premiere. 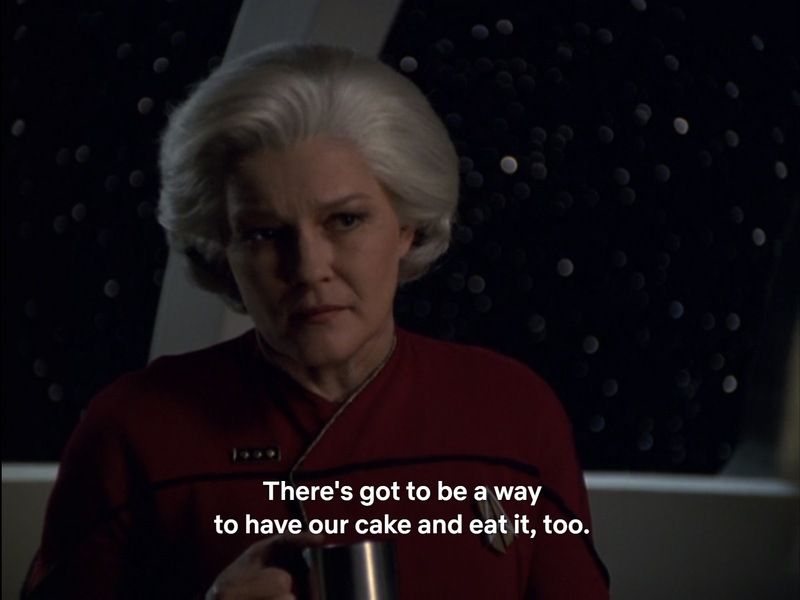 In "Endgame", however, the ethical and moral dilemma of serving one's self at the expense of others is completely negated by Janeway's insistence that she (and her crew) can "have their cake and eat it too" (her words, not mine). This is a strict indictment of the moral position of the premiere, in which the well-being of the Ocampan civilization outweighed the desire of the Voyager crew to get home. A much better story probably would have been to validate Janeway's original decision by having her repeat it. She should be personally conflicted about doing so, but she should repeat the decision to destroy or close the way home in order to protect others, and then to trust in herself, her crew, and her ship to [eventually] get her home. Janeway should have trusted in herself, her crew, and her ship to get them home. 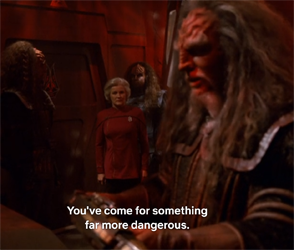 Had their not been the cop-out future Janeway present to make a consequence-free "sacrifice" with not stakes or actual sense of risk, then destroying the Borg Transwarp Hub to protect the rest of the galaxy from the Borg probably is what Janeway would have done. Voyager could have been a generational ship. It actually takes 70 years! A similar idea would have been to simply flash forward decades (as "Endgame"'s opening does) to establish that it does, in fact, take Voyager decades to get home. However, a two-hour finale is hardly enough time to recap 40 or 50 years of character development. It could have been stretched out over the entire seventh season, but even that is pushing it. So my alternate idea is less an idea for changing Voyager's ending, and more an idea for fundamentally changing the entire series. The writers could have written the series such that it spans decades. Each season could have covered several years (or a whole decade) of travel such that it actually takes about 70 years for Voyager to return home. 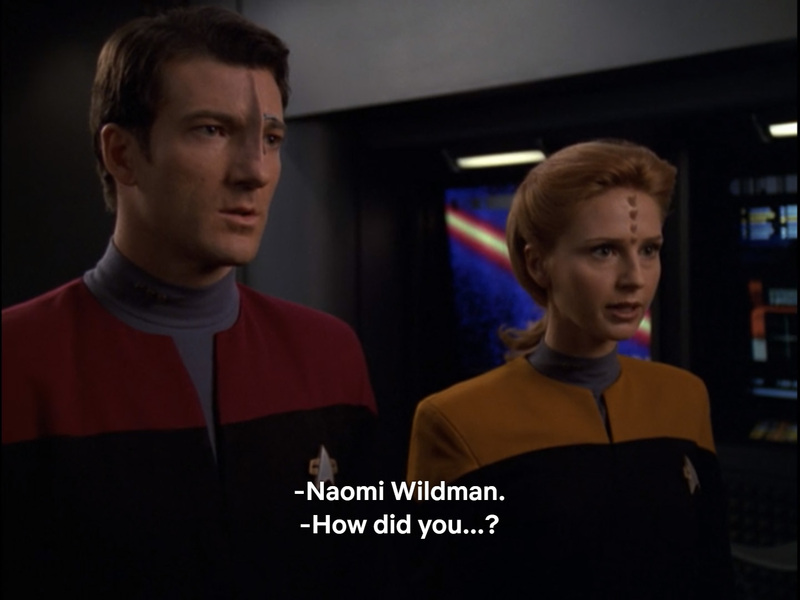 This would have required some expensive old age makeup for the entire case, which would have conflicted with [what I assume was] CBS and Paramount's desire to cash-in on a cheap TNG knock-off. Clever and forward-thinking writers could have planned for rotating the cast over time. The show could have phased out (or reduced the role of) older characters and introduced up-and-coming younger characters over the course of the series. Crew members pair off, have kids, and those kids start to take on their own roles on the ship. 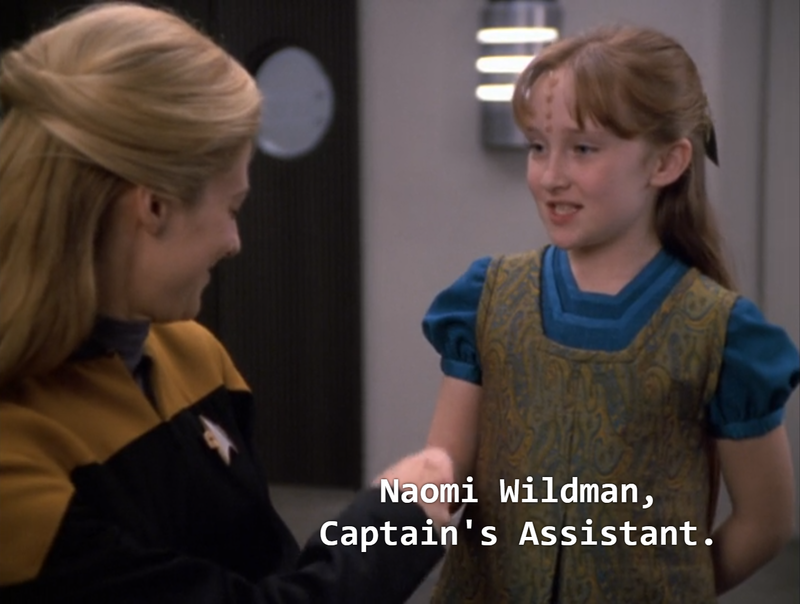 Similar to Naomi Wildman, we'd see them as young children, then as teenagers, and eventually as adult members of the crew, while their parents and the older characters would "retire" and have their roles and responsibilities reduced until they are maybe eventually written out entirely. Making a generational show would have been a brave and interesting (but expensive) endeavor. The final shot of the series could then have featured an elderly Janeway being assisted back onto the bridge by the younger officers now in command, so that she can watch the pale blue dot of Earth grow bigger and brighter as Voyager finally returns. A more pessimistic ending could have finally seen the Voyager on its last leg, forcing the crew to give up their quest to get home and settle down in the Delta Quadrant. This also probably would have required a rethinking of the series as a whole to be a bit more gloomy. 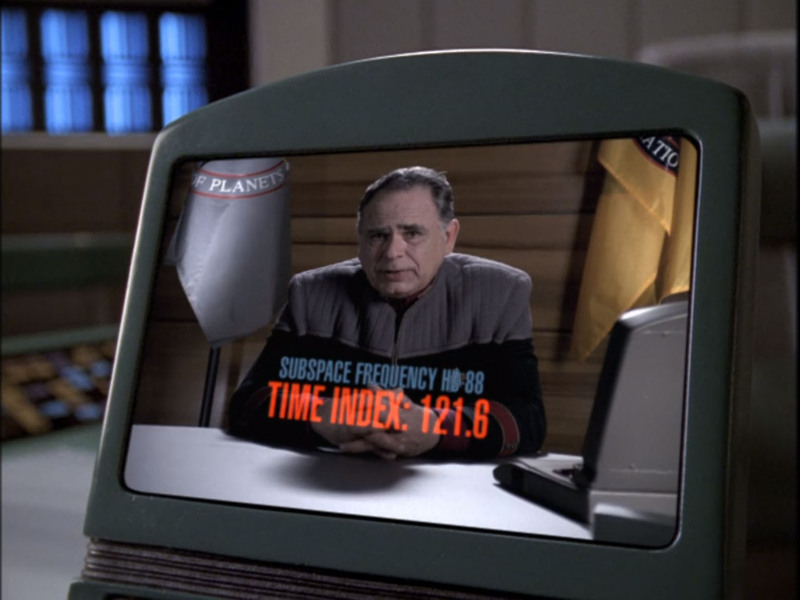 Again, if the series had been focused on the attrition of the crew and the toll that being stranded takes on them (similar to Battlestar Galactica), then Voyager could have been breaking down and limping along by the fifth or sixth season, creating a lot of dread and tension among viewers over whether the crew ever actually would make it home. 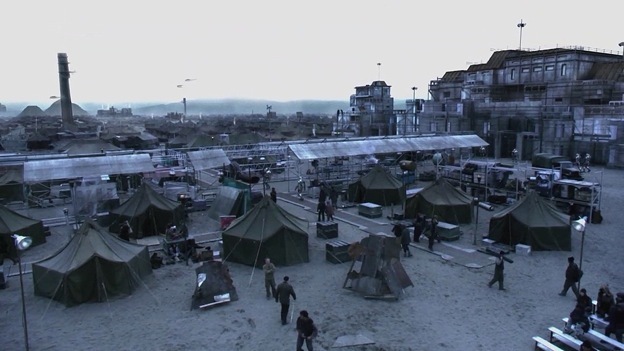 The finale could have been about the crew finally conceding and finding a place to settle down (something that also happened in Galactica's second season). Worse yet, the crew could have died trying. Similar to my first idea, maybe they sacrifice themselves for the benefit of someone else, once again, validating the ethical and moral position of the premiere. Battlestar Galactica fulfilled a lot of the promise that Voyager never met. 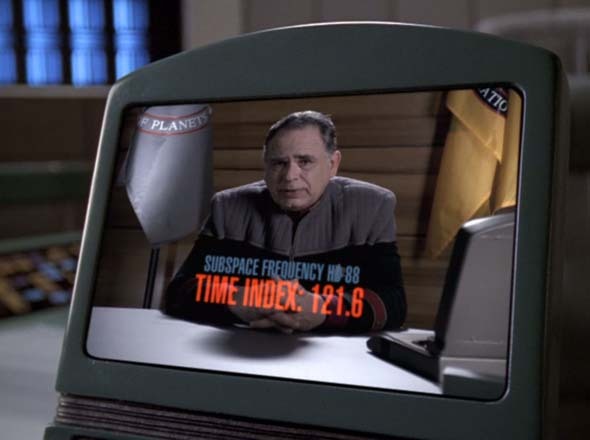 Even if the writers didn't want to be so nihilistic, and decided to let Voyager return home by the end, the inclusion of wear and tear and a continuous, gradual decline of the ship would have at least maintained a tension in the audience regarding whether the ship would survive long enough for the crew to get home. 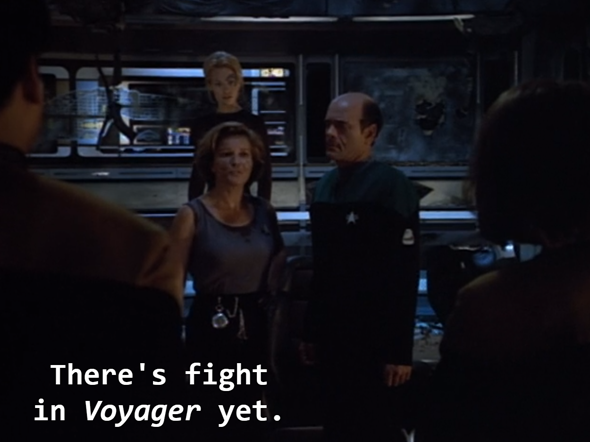 Because Voyager is always in pristine condition from episode to episode, there's never any fear from the audience that the ship won't be able to complete the journey, and so the audience has every expectation that Voyager will make it home. There's no doubt about it. That kind of foregone conclusion doesn't necessarily make for compelling TV. My favorite idea for how Voyager should have ended is that the crew should have gotten home long before the show actually ended. The season 6 cliff-hanger could have actually subverted expectations (and the Gilligan's Island trope) by actually letting Voyager return home. 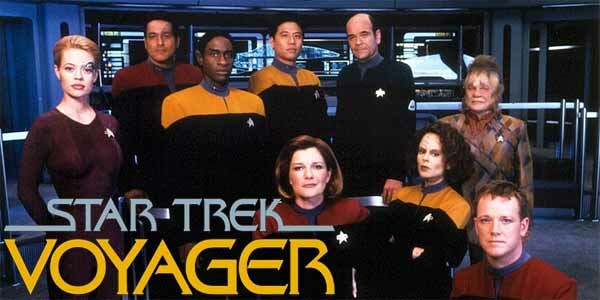 Once home, the entire seventh season could have been about the crew of Voyager adjusting to being back home, and to serve as a way of catching the audience up on what's happened to the Federation since the conclusion of Deep Space Nine. The finale brushes off what happens to the characters after they get home. Does Janeway get court-martialed for violating the Prime Directive? Does she ever see her ex-fiance Mark again? Does she at least get a happy reunion with her dog? Does Harry Kim get back together with his girlfriend Libby? What about a happy reunion with his clarinet? Does the Doctor get de-compiled or "upgraded", or does he "refuse a refit", as Commander Maddox puts it in TNG's "The Measure of a Man"? Does he become a celebrity holo-novel author? Is Seven of Nine clandestinely shipped off to Section 31 to be dissected? Does she have to fight for her rights? Is she tried as a war criminal as some sick scapegoat for all the Borg's atrocities? What about Icheb and his Borg-killing pathogen that he is genetically-engineered to create? That seems like something that would be very interesting to Starfleet Command and/or Section 31! Does Tom Paris get a loving reunion with his dad that allows the two characters to actually meet in person, in the flesh? 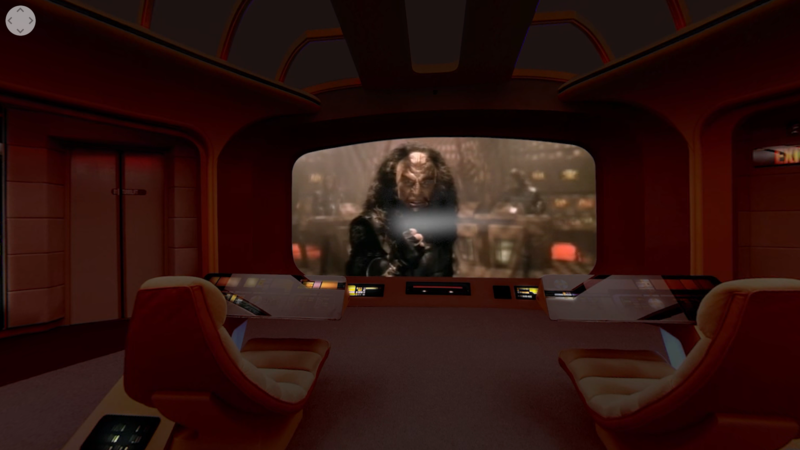 Does B'Elanna make peace with her mother? 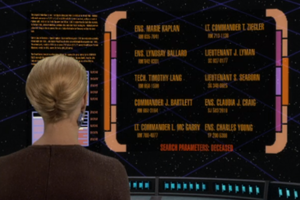 Is B'Elanna's mother actually dead? Does she actually make amends with her father? 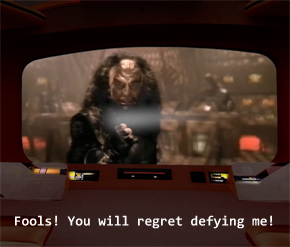 Do any other Klingons come to think of Tom and B'Elanna's child as the kuvah'magh? What finally happens with all that romantic tension that the entire series spent building up between Janeway and Chakotay? only to completely drop it in favor of Seven of Nine and Chakotay in the end. OK, granted, Kate Mulgrew was personally opposed to Janeway and Chakotay having a romantic relationship. She saw herself as a feminist icon of the time, and didn't want the first female captain on Star Trek to also be the first captain who has a [technically] inappropriate relationship with a subordinate. Fair enough. I can certainly understand that. But that doesn't explain why the two couldn't have had a relationship after getting back. Haphazardly throwing Chakotay and Seven of Nine together also ignores the intimate relationship and chemistry that Seven of Nine had with the Doctor. 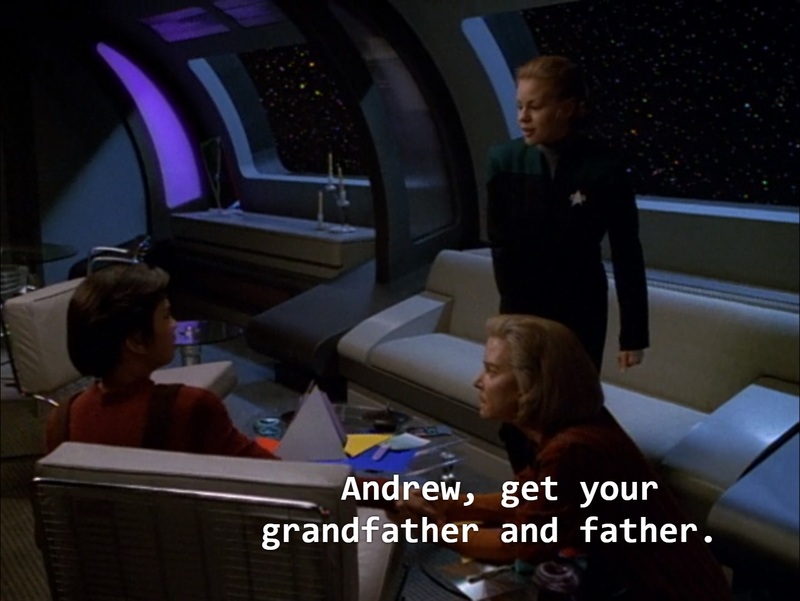 Heck, I would have bought into a relationship between Seven and Harry Kim before Chakotay. 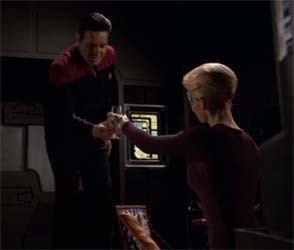 Even with two episodes towards the end that seemed to have the sole purpose of preparing the audience for Seven and Chakotay's romance, the two of them actually dating in "Endgame" still blindsided much of the viewing audience, including myself. Even on repeat viewings, I find myself dumbfounded to see them dating. Perhaps most importantly: what does the Federation do with all the former Maquis crew members? The Dominion War had only just ended a couple years ago, and a tentative peace exists between the Federation and Cardassians. How would the return of Maquis (whom the Cardassians consider war criminals whom they had already eliminated in the Alpha Quadrant) upset that peace? Basically, all these questions are left unresolved by Voyager's finale, especially considering that the time travel tampering probably obliterates the future that was depicted in the start of "Endgame". 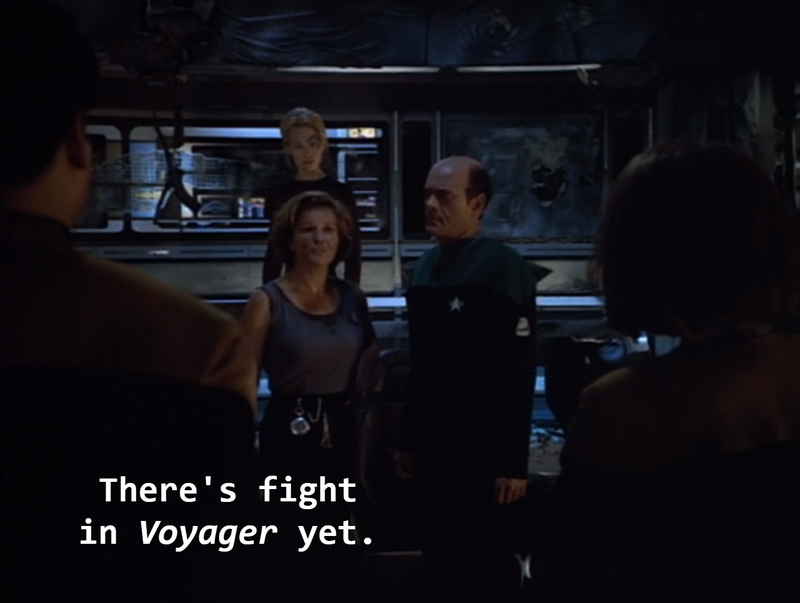 Instead, I think Voyager should have gotten home early in season seven, and rest of the season should have been spent tying up loose threads. What happens to all the former Marquis after Voyager returns? Would letting them off the hook cause tension with the Federation's new Cardassian allies? Finally, we'd get to see whether the crew stays together or goes off on their separate ways. Does the Voyager itself get decommissioned? Does Starfleet assign it to another deep space mission? Is the crew willing to go on another deep space mission? 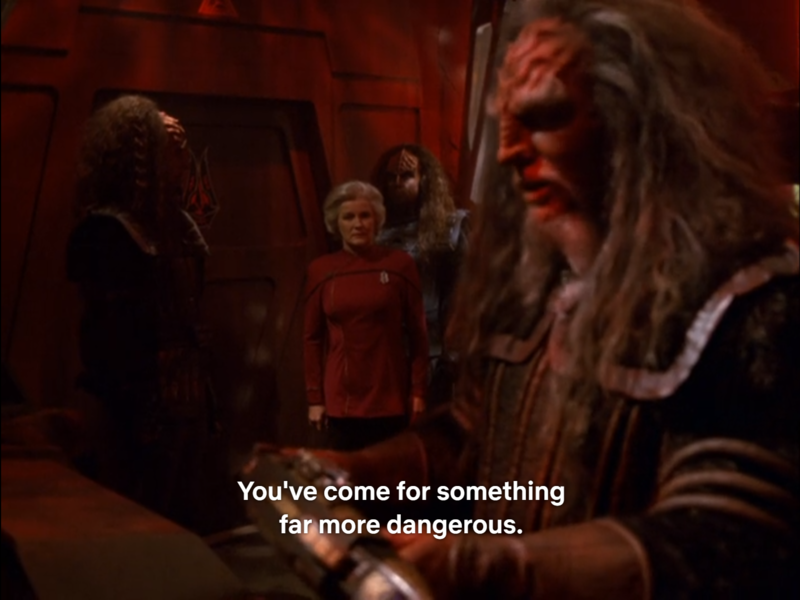 Maybe the finale could have been similar to DS9's "What You Leave Behind", with Janeway putting together a new crew, and some members deciding not to re-enlist and going their separate ways. 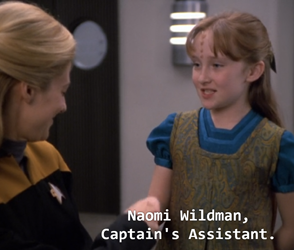 Maybe Tom and B'Elanna stay on Earth with Admiral Paris to raise their child. Maybe Tuvok has to stay on Vulcan in order to undergo the Fal-tor-voh to treat his mental deterioration. Maybe Chakotay wants to stay on Earth for some spiritual purpose, but Seven has wanderlust and needs to go back out to explore. In the final shot of the finale, perhaps Janeway steps back onto the bridge with her second-in-command, Commander Harry Kim, ops officer Seven of Nine, the Doctor (who hopefully finally has a name), Chief Engineer Vorik, Science officer Samantha Wildman, captain's assistant Naomi Wildman, and astrometrics officer Icheb, as they set off on the continuing voyagers of the Starship Voyager. 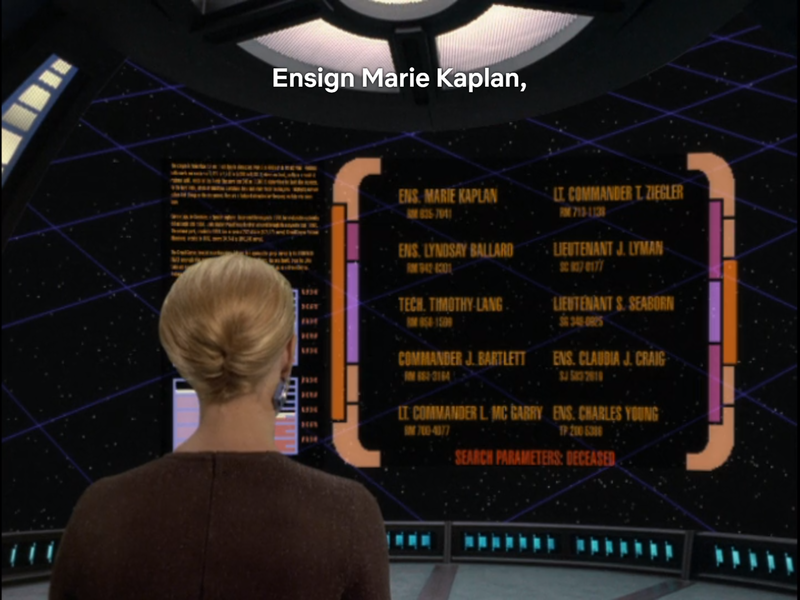 Wow, that's an ecclectic list of endings that I would have preferred over what Voyager actually gave us. It just goes to show that literally any other ending would have been better than what was actually offered.